“What should I do when it comes to the question of HVAC repair service or replacement?” This is a question we get a lot from customers. When your household appliances break down, should you repair them or simply buy replacements? This is a vexing question that all homeowners are familiar with—and sometimes it can feel like a bit of a gamble. HVAC Repair services are usually less expensive in the short term, yet those repairs may not last long—and there will come a point at which repeat repair costs really start to add up. HVAC Replacement may prove more costly up front, but also more convenient—and is often a better bargain in the long haul. Several questions are important to consider as you think about your HVAC unit. Salt Air, Inc. takes pride in selling and installing only the best products, designed to hold up for a good long while. However, no HVAC unit will last forever. 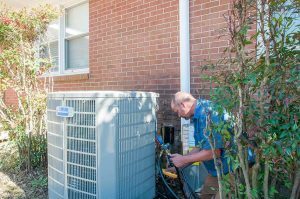 With the proper maintenance yours should enjoy a long lifespan—so whether you elect HVAC repair services or replacement, you can rest assured that you’re getting a good value. This is the biggest up-front concern. HVAC repair will likely be less expensive than installing a whole new model. At the same time, you should consider the current age of your machine. If it’s on its last legs anyway, and needs to be replaced within a year or two regardless, then repairs may not make sense. Also consider the reality that, for older equipment, you may have to make additional repairs sooner rather than later, which can be inconvenient. Another consideration is that newer units will offer greater energy efficiency, which means monthly utility savings. They may not ever pay for themselves, necessarily, but they can definitely make a difference in your bottom line. Every situation is going to be different, but these considerations may help you make the right decision for you.